IGBC - HQR — Danielle Townsend Design Graphic Design and Brand Identity Design Dublin, Danielle Townsend Design is a Graphic Design and Visual Thinking agency based in Dublin. 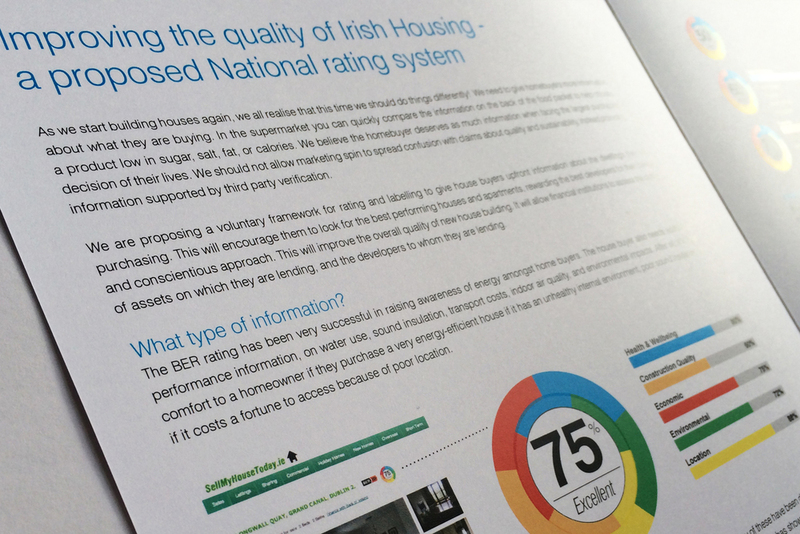 A new rating tool that measures not only energy efficiency in homes but also a variety of other factors, from environment, quality of construction right through to location is being developed for the building sector. The brief - to create a brand called the HQR - Home Quality Rating on behalf of the IGBC. The measure of excellence for this tool will relate the 5 distinct areas. To communicate these areas colour coding was employed as a way to identify each category. The ultimate goal of the rating tool is to have a holistic approach to building development and to the planning for buildings. The concentric bands attempt to communicate this message and the sans serif has been used for its modern open face to assist in communicating the transparency this brand wishes to symbolise. The HQR is still in the testing phase and once complete is expected to roll out nationally. A website will also be launched to support the project - allowing the consumer to find the rating for their own home and the property investor to do likewise for the future investments.